THE HIGHEST ORDER: Thank you. Sometimes you can not tell if the point of your collective life has even been heard. We put out "Still Holding" in June and we didn't premiere it online, with the notion that maybe you heavies would pick it up or listen to it in full at home or on the radio, through some real speakers or while doing something screenless. The advertorial world can feel very aggressive and disingenuous, so we wanted to escape that particular taint, and have people come to it on their own. 2016 shows were all spectacular, and it feels very real, so thank you to live show goers who came to rip. 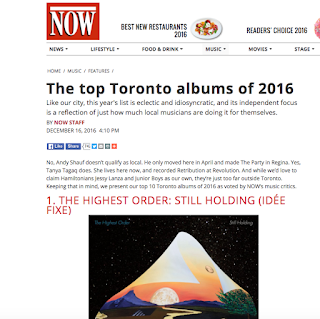 And here we have some indication that critics are listening - it feels pretty good to be awarded top Toronto album of the year at NOW Magazine. Thanks for hearing it. Another thing we should talk about since it's probably our last entry here for 2016, is how Simone TB really upped the social media game, and in turn set fire to Simone Schmidt's efforts administering social meds. Tempted to do a top ten list of social media moments, but you know, you can just follow us. Anyway, if you wanna see us play festivals this summer, call your festival people and tell them to book us.